FAIRPORT, Mich.A wooden beam embedded at the bottom of northern Lake Michigan appears to have been there for centuries, underwater archaeologists announced Tuesday, a crucial finding as crews dig toward what they hope is the carcass of a French ship that disappeared while exploring the Great Lakes in the 17th Century. Expedition leaders still weren't ready to declare they had found a shipwreck or the long-lost Griffin. The ship, commanded by the French explorer La Salle, was never seen again after setting sail in September 1679 from an island near the entrance of Green Bay, in what is now northern Wisconsin, with a crew of six and a cargo of furs. But Michel L'Hour, director of France's Department of Underwater Archaeological Research, said the timber appears to be a bowsprit, which is a spur or pole that extends from a vessel's stem. It also appears to be attached to a hard surface below the lake bed. "All the details could be interpreted as part of a bowsprit and there's no details which contract this hypothesis," said L'Hour, who inspected the beam Monday with two French colleagues. "It's why it's the main hypothesis now. A bowsprit which has been buried in the sediment of the lake for many centuries." Scientists and divers began excavating last week at the base of the wooden beam, hoping to determine whether it is part of the Griffin. Steve Libert, a diver and shipwreck enthusiast who has searched three decades for the Griffin, discovered the timber in 2001 and recently obtained state and federal permits to probe beneath the muddy surface. 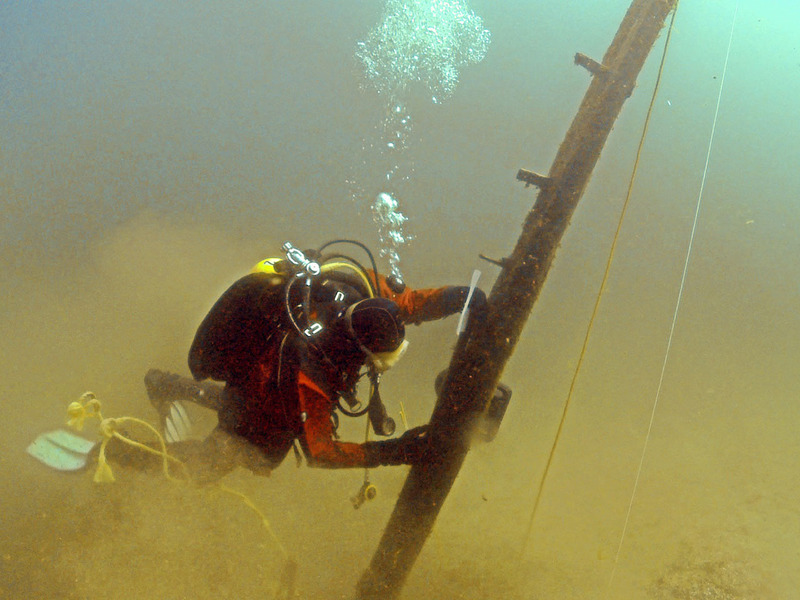 The wooden beam extends 10.5 feet above the lake bed, and underwater excavators are opening a pit at the base of the beam to determine whether it's attached to anything beneath. In another key development Tuesday, they reported that a probing device had detected a hard surface 18 to 20 feet below the lake bed. "In essence, we have found a floor under that exposed wooden timber," said Ken Vrana, the project manager. "We have more excavation to do before verifying what that surface is." Libert said he was excited by the reports and had "no doubt" the beam was part of a ship. But it remained uncertain when the team might be able to positively identify the vessel. "I think that maybe Steve found the Griffin," L'Hour said at a briefing for reporters. "I can't be sure, which is why I'm waiting and waiting and waiting for the proof."